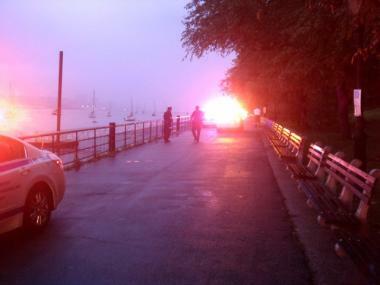 The body of a 25-year-old man was pulled from the Hudson River near West 79th Street on Monday afternoon. Cops responded to the area for a similar incident, seen here, back in 2011. UPPER WEST SIDE — The body of a dead 25-year-old man was pulled from the Hudson River near West 79th Street on Monday afternoon, police said. Members of the NYPD Harbor Unit found the man close to the West 79th Street pier near the Boat Basin Cafe about 4:15 p.m., cops said. The man, whose identity was not immediately released, was pronounced dead at the scene, cops said. The medical examiner will determine his cause of death. Another man's body was recovered in the same area in 2011.